CHAMPIGNY-SUR-MARNE lies 8 miles south-east of Paris on the banks of the Marne, a river called after 'Matrona', a water spirit. Its population is now around 80,000. Champigny's proximity to Paris has affected its history. During the Roman Conquest, the Romans established a base camp on the loop of the Marne. Champigny also felt the ravages of the Hundred Years War when the fort to which the local people had fled for safety was put to the torch. During the revolution and its aftermath the community witnessed more bloodshed. Nor was it to escape the horrors of the Napoleonic, First and Second World Wars. In World War II, resistance activity was particularly effective in acts of sabotage and in helping the allies to escape. The people of Champigny are particularly and justifiably proud of their National Museum of the Resistance which brings the work of the Resistance movement alive through audio-visual displays. Another building to visit is the beautiful little Romanesque church of Saint Saturnin, which has recently been carefully restored. 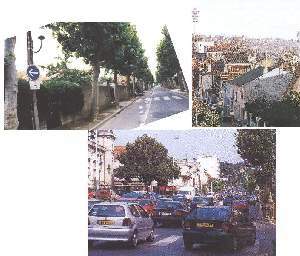 Today, Champigny very much believes in its youth, and educational facilities have been provided for their development. Colleges work hand in hand with industry on projects which provide practical experience for the students, whilst industry gains from the fresh approach of youth. Nor are the elderly forgotten, as youngsters are encouraged to seek their opinions and respect their experience. All in all, a great community spirit is encouraged and cultivated. Click here to find out more about twinning in Champigny. Amended July 1999, December 2000,and by Rod Reeves Feb 2004.